Festival of Sail opens in Oswego. The event runs Friday through Sunday. Oswego’s first-ever Festival of Sail was greeted this morning by pleasant weather and a large crowd. Vistors were able to check out the Marine Museum’s LT-5 Tug and the Unicorn in background. The Shadow Players pirate stage combat group will be performing at various times Friday and Saturday. The Pride of Baltimore II and the Lynx are also in port for the three-day event. The hours are 10 a.m. to 6 p.m. daily. Today June 25 â€“ Community welcome.Â Dedicated to families and our Active Duty, Reserve and Retired Military men and women. All military will be offered a 50% discount on their admission by showing their military ID. Water related youth activities will highlight the day. Along with tall ship tours, sail aways on the Lynx, tours of H. Lee White Marine Museum, and historical presentations will take place throughout the day. Saturday, June 26 â€“ â€œDunkinâ€™ Donuts Dayâ€ at the Oswego Festival of Sail. Tall ship and museum tours, sail aways on the Lynx and youth activities. 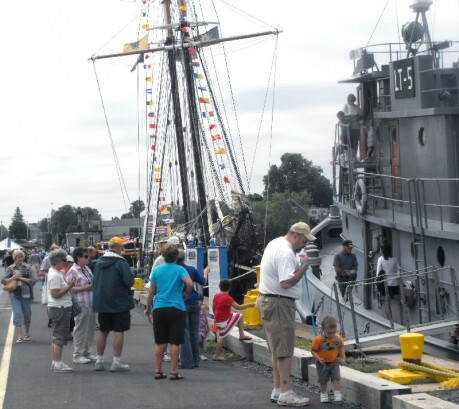 The Oswego Festival of Sail Stage will feature The Cortini Brothers with Tommy Ciappa and Joanna Jewett from 3-5:30 p.m.
Additionally, the Oswego Station of the US Coast Guard will have itsÂ 47-foot Motor Life Boat available for tours on Saturday and Sunday. Sunday, June 27 â€“ Tall ship and museum tours, sail aways on the Lynx and youth activities. The Oswego Festival of Sail Stage will feature Doc Apple from 3-5:30 p.m. in concert on the main stage. A portion of the proceeds from the event will benefit the H. Lee White Marine Museum. For more information, call (315) 402-8802 or visit www.hleewhitemarinemuseum.com or search Oswego Festival of Sail 2010 on Facebook.